It has been 10 years since the BIM Handbook was first published, when it emerged as the definitive guide to BIM (building information modeling) for both practitioners in the industry as well as students and researchers in academia. Extensively researched and meticulously written by a team of leading researchers and experts in AEC technology including Chuck Eastman, Paul Teicholz, Rafael Sacks, and Ghang Lee, the third edition of the book has just been released. I have had the privilege of being associated with the BIM Handbook since it was first published—I reviewed the first edition when it was released in 2008 and wrote the Foreword for the second edition which was published in 2011. Coming seven years later, I was looking forward to exploring how the new edition of the book had managed to capture all of the many developments in the world of BIM that have emerged in the intervening years. Ten years ago, when the first edition of the BIM Handbook was published, BIM was still relatively new, and the industry had to be “sold” on it, so to say. Now, it is the undisputed way of working in the AEC industry and the focus is entirely on how to best implement it rather than on justifying its use by enumerating its benefits. Also, with the increasing convergence of technologies like cloud computing, AI (artificial intelligence), machine learning, big data, IoT (Internet of Things), mobile computing, etc. in all industries, BIM has to now be examined in the context of all these developments as well and their impact on the AEC industry. It is quite a challenging task to distill all of this into a book. Let’s see how the BIM Handbook does it. 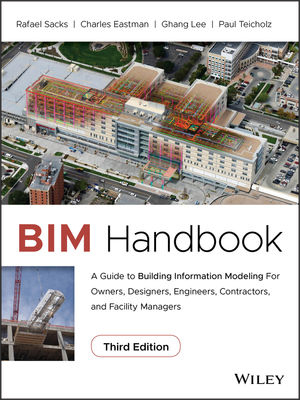 When it was first published, the objective of the BIM Handbook was to provide an in-depth understanding of the technology and processes behind BIM, the business and organizational issues associated with its implementation, and the advantages that the effective use of BIM can provide to all members of a project team, including architects, engineers, contractors and sub-contractors, construction and facility owners. This continues to be the core mission of the book—to be a comprehensive resource of both practical and theoretical information on BIM. It is a “handbook” in the true sense of the word. The book is organized into four sections. The first section provides a general—i.e., not specific to any one discipline—introduction to BIM and supporting technologies, covering topics such as current business models in AEC, the limitations of the traditional approaches, how BIM helps, what BIM is and what isn’t, the challenges in BIM implementation, the different applications for creating and reviewing BIM models, and how an extended project team can collaborate using BIM. Since the book is agnostic to the brand of software being used, the discussion of interoperability—which allows different software applications to work together—is a key component of the collaboration section and includes details of all the main open standards such as IFC, CIS/2, COBie, Omniclass, etc., that have been developed for AEC. The second section provides discipline-specific perspectives of BIM, with separate chapters devoted to owners and facility managers, architects and engineers, general contractors, and subcontractors and fabricators, allowing readers from these disciplines to easily find the information most relevant to them. While BIM has, by now, become well established for the design and construction of buildings, it is not yet commonplace for their operation and maintenance, so the chapter on BIM for owners and facility managers is particularly significant. While there is some discussion here of the technical aspects such as what information a BIM-FM model should have and how to get BIM information into the CMMS (Computerized Maintenance Management System) solution used for facility management, the bulk of the chapter is devoted to broader issues such as why owners should care about BIM, issues they should consider, the barriers they may encounter, and how they can not only encourage but actually lead the BIM implementation on a project. The third section is focused on looking at BIM from an industry-wide perspective, not just in one country or a group of countries, but across the world. Where are we currently on the implementation scale, and where can we go in the future? What is being done by governments in different countries to encourage or enforce the use of BIM, given that it is clearly the “better, faster, and cheaper” way to build? All of this information, including mandates, standards, roadmaps, maturity models, guides, etc., is compiled into a brand-new chapter that was not there in the previous editions. With regard to where we can go with BIM, the book looks at current trends, where we are likely to go by 2025 and even beyond, with predictions such as fully digital design and construction, off-site construction, automated code-checking, artificial intelligence in construction, and support for sustainable construction. As with the previous editions, the concluding section of the book presents a collection of case studies that are used to illustrate the use of BIM in practice. The examples run across the implementation spectrum, covering the use of BIM in different phases of the building process, on different types of projects, and in different parts of the world. Even though the use of BIM in advanced ways for building design and construction is well documented by now—most BIM vendors have annual awards highlighting the best work being done using their solutions—what is compelling about the case studies in the BIM Handbook is how comprehensive they are, with detailed descriptions of the project as a whole, the team, the processes, the use of different applications at different stages, the benefits achieved, the challenges, and the future outlook. It is like having a complete blueprint of the BIM implementation on a project, which can be used by others embarking on similar implementations for guidance. In addition to the technologies commonly used in BIM such as multi-disciplinary modeling, analysis and simulation, coordination and clash detection, project and document management, rendering and visualization, and construction estimating and scheduling, the selected case studies also highlight the use of laser scanning, augmented reality (AR) and virtual reality (VR), design scripting, crowd simulation, offsite prefabrication, and BIM-based FM. In an age when there is almost a glut of information available online on BIM, the need for a resource like the BIM Handbook is even more pertinent. It brings together all of the critical information on BIM and its implementation in one location, systematically and methodically, without any bias towards any one solution or vendor. Those who want the complete lowdown on BIM don’t have to comb through hundreds of online articles and posts and figure out which information is current and which is outdated, which information is of lasting rather than fleeting value, and which information is relevant to their discipline and the projects they are working on. Authored by the best minds in our industry, the BIM Handbook has succeeded in separating “the wheat from the chaff,” so to say, and can serve as the base reference for further explorations of specific aspects of BIM. The information it contains is something everyone working in the AEC technology industry should have a better understanding of. I also found the production quality of the book to be excellent, with an aesthetically pleasing layout and the use of color throughout, which greatly helped to clarify the illustrations accompanying the text. This was a welcome improvement over earlier editions, where the lack of color reduced the impact and elucidation capability of the images. Looking ahead, I hope that future editions will cover in more detail topics such as the extension of BIM to infrastructure modeling and city information modeling (CIM), technologies such as rule-based and generative design to make BIM smarter, and the kind of research in academia that we need to see more of to move the industry forward faster. It would also be useful to look at automated code-checking in more detail, not just at the technological aspects involved, but the logistics of implementing it from the point of view of the authorities who write codes and check for compliance. Given how long we have had the technology, what is the holdup? Similarly, it would help to understand the holdup in the implementation of BIM for FM. Why are even the new buildings of the world’s leading technology companies such as Apple and Facebook—designed by star architects such as Norman Foster and Frank Gehry—not deploying BIM for facilities management and operation? It would also be extremely interesting to study the use of modeling and simulation in other fields such as medicine and EDA (electronic design automation for computer chips) and see if there any lessons we can learn from them to apply to our own.